Markets don’t like instability, and the disarray now extends to the Fed. It is odd out there. High-volatility markets have gone still. Long-term interest rates certain to rise have fallen, mortgages back in the threes. The 242-seat Republican majority in the House is captive to 40 wild men, the party in many ways no longer a party. Vladimir’s latest excursion is only one miscalculation, one misidentified aircraft, one mis-targeted missile from a lot of people fighting each other who had not intended to. Europe refusing involvement in Syria now finds Syria on its roads, sleeping in its fields and railroad stations. China is silent and opaque. Markets don’t like instability, but they do have a large tolerance for the misbehavior of politicians. That’s what politicians do, so we may as well not bother to react. Perfect. We’re going to raise our rate any minute, but that minute never comes. We’re going to raise our rate any minute, but that minute never comes. An even better option: You have for more than a year seen conditions for an imminent rise in your overnight rate. 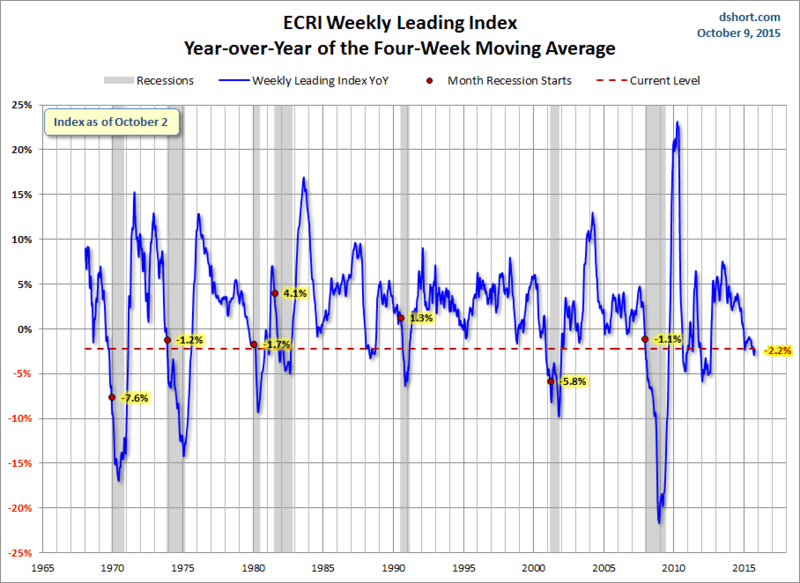 What failure in your forecasting has caused imminent to be continuously non-imminent? The error is plain. Painfully so. Worst of all, discrediting. If you’re the central bank, don’t say a word you’re not sure of. Everyone in the markets is exhausted with being Alice to Yellen’s White Queen. The stock market in its natural role as the Mad Hatter has decided that a Fed on hold is good news even though the hold depends on a weakening economy. The Fed has over-relied on an ancient measure, the notion of “full employment,” which, if reached, means inflation ahead of which the Fed should lean against. It is now clear that the Fed either does not know how to define full employment or its level — or, in a globalized world the relationship between low unemployment and wage growth. Internal disagreement at the Fed as expressed by regional presidents should usually be ignored, but Narayan Kocherlakota this week roused to a significant argument. He says the Fed prematurely tightened in 2013 by ending quantitative easing (QE), and he has a lot of data on his side. The U.S. has not had a normal business cycle since the recession of 1991 (and even that was the first “jobless recovery”). All post-WW II recessions involved not just rising wages as unemployment fell, but also an overheated credit cycle. Today we have neither, bank credit flat-lining in September. The Fed has been guessing, and badly. The Fed has word-played for two years: “We do not intend to tighten, just to remove excessive accommodation.” Oh, horsefeathers. They do not intend a minor, technical liftoff from zero, but to try to slow the economy down — in their plain words, and Congress, the White House, and the presidential-candidate freakshow, all oblivious. By comparison, the White Queen looks out of touch, looking backwards into her mirror. It is essential that the Fed chair appear on top of any situation, even if she’s not. 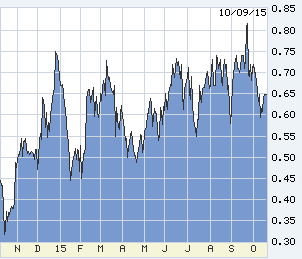 Ten-year T-note in the last 12 months. Double-bottom at 2.00 percent, but descending tops since July. The two trendlines will soon collide, but the global economy will decide the next trend. 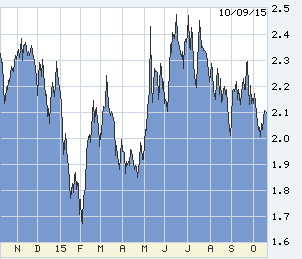 Two-year T-note, Fed-predictive, one year back … in complete disbelief of “normalizing” blather from the Fed. One of Kocherlakota’s charts. Not rocket science: 2015 is a stall, and at a low level. Another Kocherlakota. 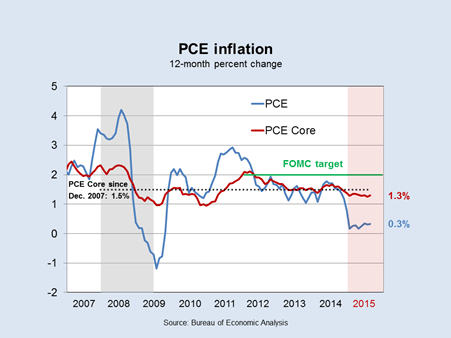 After stability, inflation is the Fed’s whole purpose, and it’s been falling for four years. JOLTS (Job Openings and Labor Turnover Survey) used to be a reasonable predictor of wage pressure. The more openings versus hires, the more demand for labor and employers competing by paying higher wages. 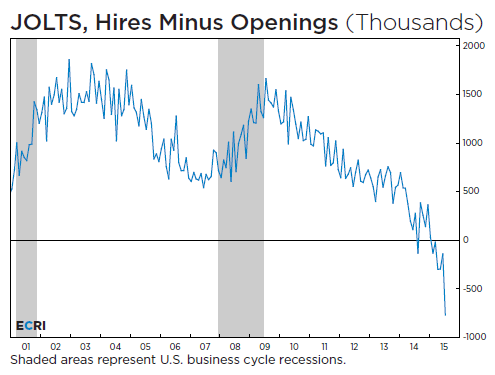 If accurate today, wages would be screaming up — more openings than hires! 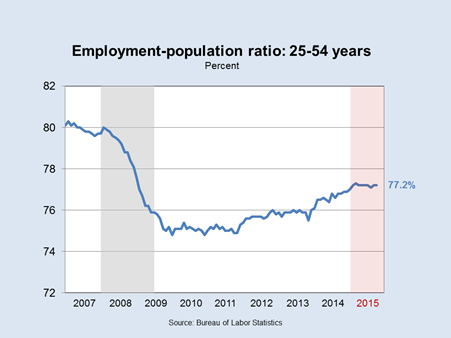 Today’s chart painfully obvious: Old, reliable metrics do not function now. 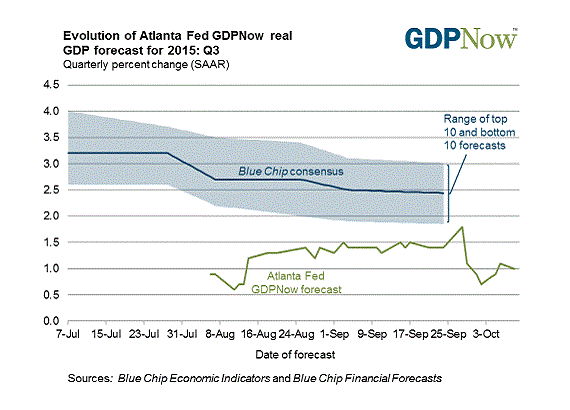 The Atlanta Fed tracker has been spooky-accurate. Many people believe the economy is trundling along at 2 percent growth. No, it’s not. By the way: For Blue Chip economists I would not give a bucket of warm expectorant. And the Fed has done little better. Back to 1968 only one false call (2011), likely intercepted by QE. Not yet warning of recession, but not happy.